99,00 € tax incl. 84,15 € tax incl. 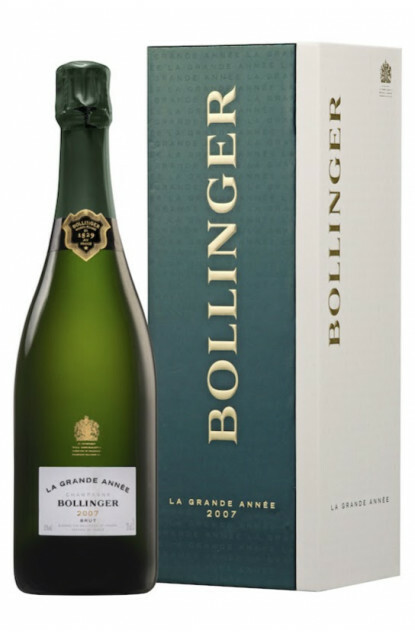 The Prestige Bollinger vintage, elaborated solely during the great years. This Champagne is a blend elaborated solely from grape harvested on plots that are classified Grand Cru or Premier Cru. It was vinified in wooden casks in oak barrels then aged under cork and kept in the House’s famous chalky cellars. The colour is a magnificent aged gold. To the nose : toasted notes followed by fruity notes, ending on an elegant spicy note. The wine opens up after a moment on gourmet aromas. To the palate : an affirmation of the nose’s sensations with a great smoothness. A great potential of ageing for a decade, always in cellar away from light, noise, and bottle laid flat. Perfect for a whole dinner, from aperitif to the end with cheeses like Chaource. The origin of the Bollinger House is Athanase de Villermont (born in Cuis in 1763 and died in Aÿ in 1840), a marine officer in the French army, who excelled during the US independence war, most notably during the Chesapeake battle on the 29th of April 1781. A few years later, he inherited a vast family estate around the town of Aÿ, a territory well-known for the wines of Aÿ, that would later be named “Champagne”. His origins didn’t allow him to devote himself to trade, so he had the great idea to create in February of 1829 a House of Champagne wines, in the form of a company. The House is named Renaudin-Bollinger and Co: Joseph Bollinger would take care of trade while Paul Renaudin would be cellar master. Joseph Bollinger married Louise-Charlotte in 1837, daughter to Athanase de Villermont. Joseph was born to this married couple, followed by Georges. Both faced with courage and success the Phylloxera crisis in 1875 and 1895 and the Great war. Jacques Bollinger, son of Georges, became head of the House in 1920, and married Elizabeth Law de Lauriston-Boubers in 1923, who became a widow during the second World War but kept managing the Bollinger House on her own. The Bollinger generation carried on and in 1994, the House is managed by Joseph Bollinger’s great grandson. While the family still owns it, the House is currently managed for the first time in its history by a stranger, Jérôme Philippon, a talented manager with a great career path. The Bollinger House, which has been for almost two centuries constantly in search for excellence, is one of the last few houses to still have a cooper. He cares every day for 3.500 barrels, among which some are more than a 100 years old. An expertise that the House aims to sustain.